Almost everyone knows someone who’s been afflicted and/or affected by breast cancer. My first experience was in my twenties when my mother learned at an annual doctor’s visit that she had a lump. My brother, my wife, and I were there days later when she got the news confirming that she had breast cancer. I can still see her look of confusion and fear as she said, “Well boys, I have it.” Mom didn’t cry—she just stared at the floor saying nothing. The treatment hadn’t yet started but she was clearly already in pain. Since then I’ve had four cousins and many friends who have had that same exchange with their doctor. While I wasn’t there for any of those meetings, upon hearing of the diagnosis I remembered that day with our mom and the look on her face. Today, a very good friend Dana Manciagli, is dealing with her third bout of stage four breast cancer and we’ve been on her Strides team, Dana’s Gladiators, for the past four years. We will walk with her again in the annual Making Strides Against Breast Cancer event in Seattle this month. Today, I’m asking you to consider two ways to help all those afflicted and to keep more from experiencing this disease. 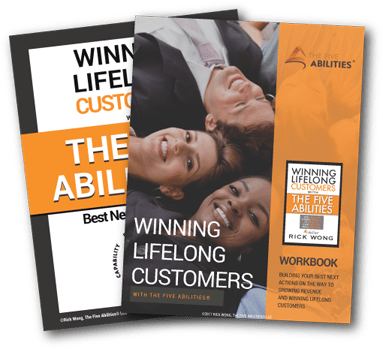 October is Breast Cancer Awareness Month, during which time I’ll donate 100 percent of the royalties from my book Winning Lifelong Customers with The Five Abilities®. I know there are many unfortunate things happening that are leading to requests for your generosity and this is yet another. In hopes of making it easier for you consider this gift I’ve reduced the price of the Kindle book from $9.99 to $4.99. 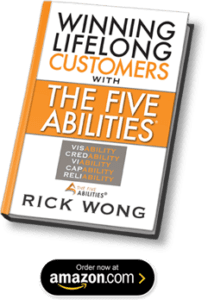 Due to unforeseen challenges, my publisher can’t reduce the price of the print versions but I will also be donating 100 percent of those royalties during October. Thank you very much to those who have already purchased the book. Please consider the professionals and students in your life, who might want to make a small gift to Making Strides Against Breast Cancer while also benefitting from the lessons in the book. 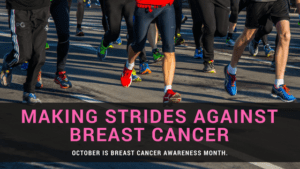 Making Strides Against Breast Cancer is an annual 5K walk taking place in Seattle and many other cities, bringing awareness to disease. We’re again walking as Dana’s Wong Way Gladiators and you can click here to directly donate to Making Strides to help them close in on a cure. Each year nearly 250,000 women are newly diagnosed with breast cancer. An additional 2,500 men are also diagnosed. We’re making strides each year but still over 40,000 women and over 400 men lose the battle. It’s so prominent that everyone reading this probably knows someone who has been affected and/or afflicted. You know a co-worker who is absent dealing with this disease or caring for a loved one. You’ve watched relatives and close friends struggle with the aftermath of treatment. You’ve been to head shaving parties that signal the start of treatment. YOU WANT THIS TO STOP. No matter how you give or how much, know that we are very appreciative of your generosity and the attention you’re giving to stomping out breast cancer. Thank you very much.